Tarte makes some very nice products, many of them incorporating this Amazonian clay. I have found their long lasting blushes to stand true to their name, seeing as how they stick around for hours on end. The Bobbi Brown pot rouge is a great multi-tasker, suitable for use on both the cheeks and lips. I actually love layering this pale pink shade underneath my Tarte dollface blush. The pot rouge does not dry down to a matte finish so this layering method really sets it. This bronzer is a beautiful warm matte brown, which works best on medium skin tones. I purchased mine before the milk chocolate soleil was released, which would be a better match for my pale complexion. This is a true makeup artist favourite. I have the palette form of this classic MAC concealer, which I use nearly every single day. Incredible coverage and an even better shade range. Go MAC! This small palette was a 500 point perk from Sephora, which includes 4 of Bobbi Brown's best eye shadow shades. I love the combination of these neutral matte shadows since they can create a beautiful smoky look, while also doubling as eyebrow powder. I love creamy and richly pigmented eye pencils, but can't justify spending a ton of money on them. Bourjois is an amazing French "drugstore" makeup brand, which, so they say, is produced at the same factory as Chanel makeup. These liners are sold at many Shoppers Drug Mart locations in Canada and are under $20. Oh what a beautiful product this is. Dior Airflash aerosol makeup is formulated with a very fine mother of pearl pigment, best suited for special occasion makeup. I of course thought this pearl pigment was complete bs.. until I tried it. The sheen of this product is so unique and definitely pearl-like- Not matte and not shimmery. Unfortunately, the shade range is quite poor and runs fairly dark. I apply this foundation with a synthetic foundation brush to achieve the most natural, lightweight finish. Be sure to shake, spray onto a small bowl, and then apply. Don’t spray directly onto the skin! Mineral powders are so versatile since they can be used as a setting powder, or buffed into the skin as a full on foundation. Laura Mercier's mineral powder has a gorgeous, glowy finish and looks very natural on the skin. She also has a translucent setting powder, which is even better for setting a more full coverage foundation. I honestly hate expensive mascara. I've read that even the best makeup artists in the world swear by the classics, like Covergirl LashBlast. That being said, I only use sample sized high-end mascaras and have gone through a few Diorshow's over the years. It is a wonderful mascara and won’t let you down if you’re looking for added volume and length. These Clinique lip products are veterans in the new “tinted lip balm/stain twist-up crayon stick” craze. After getting one right after their release in 2011, I was just waiting for drugstore brands to come up with their own rendition. Sure enough, Revlon has now taken the lead in producing these fun, twist up jumbo crayon balms. It now seems like every single makeup brand is also hopping on the tinted balm bandwagon. I will stay true to my roots, and say that the Clinique formula is more comfortable on the lips and has a more classic colour range. This blush deserves an honourable mention since it's the ultimate superstar in high-end makeup. Although I wouldn't say it's completely worth the hefty price tag, the unique sheen and of this powder is absolutely stunning on all skin tones. When I'm in the market for a new makeup product, I don't immediately resort to searching through Sephora. Department store brands are not always better quality than cheaper drugstore options, so try to avoid getting suckered into the claims. 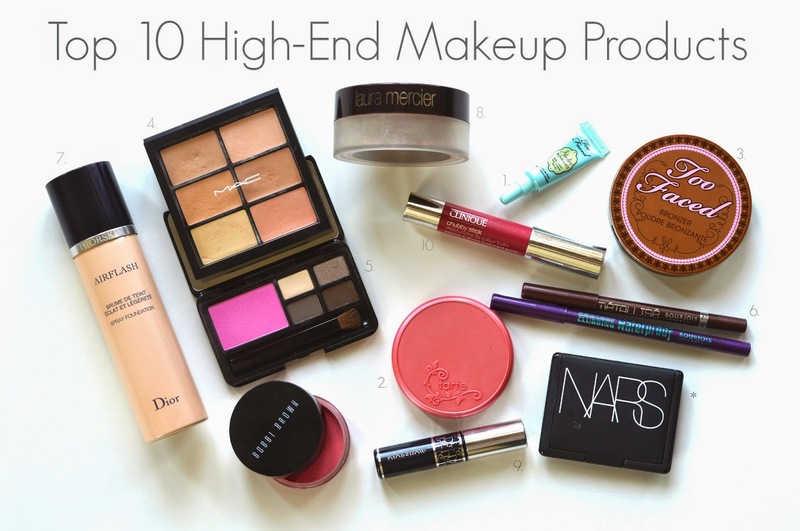 For those interested in my lower-end faves, see my top 10 drugstore makeup products, here.